Programme of follow-up actions to be submitted to MEPC 73 for approval. An intersessional working group (ISWG) to develop a programme of follow-up actions to IMO's Initial Strategy on reducing greenhouse gas emissions from ships is due to close on Friday, October 19, prior to next week's 73rd Marine Environment Protection Committee (MEPC) meeting. The Initial Strategy, adopted in April this year, sets out a vision to continue to reduce GHG emissions from international shipping and phase them out, as soon as possible - in this century. The Strategy provides clear direction to the shipping sector and its partners to stimulate investment in developing low- and zero-carbon fuels and innovative energy-efficient technologies. Opening the session of the Intersessional Working Group on Reduction of GHG Emissions from Ships (ISWG-GHG), IMO Secretary-General Kitack Lim told the meeting that "it is now time to turn the page and embark together in implementing the Initial IMO Strategy... You are cordially encouraged to engage with determination this week, setting up a clear programme, in line with the vision, principles and levels of ambition of the Initial Strategy to make it alive, so that a programme of follow-up actions can be approved next week when the (Marine Environment Protection) Committee meets." The intersessional group will report to MEPC 73, which meets next week, and is expected to further develop and approve the proposed action plan. The intersessional meeting is being chaired by Norway's Sveinung Oftedal. Opening remarks by Kitack Lim have been provided below. Intersessional Working Group on Reduction of GHG Emissions from Ships (ISWG-GHG), Fourth meeting, October 15-19. Opening remarks by Secretary-General Kitack Lim on October 15. Mr. Chair, distinguished delegates, good morning to you all. I am very happy to see that your Chair looks so much happier and more relaxed than some months ago, as well as all of you, you look very happy! You have to be proud of yourselves. It is a pleasure for me to welcome you to the fourth session of the Intersessional Working Group on reduction of greenhouse gas emissions from ships. Last April, you have achieved a historic development to fulfil the objective of finalizing the draft Initial IMO Strategy on reduction of GHG emissions from ships, for adoption by the Committee. I know that negotiations were long and difficult for everyone, and they are still probably fresh in everyone's mind. However, having made the important step with the adoption of resolution MEPC.304(72) it is now time to turn the page and embark together in implementing the Initial IMO Strategy on reduction of GHG emissions from ships. I am very pleased to see that the Initial IMO Strategy has been recognized by the whole UN system and the global community as a major step forward in global action to combat climate change. I am also encouraged to see that it has been fully acknowledged by the shipping industry and, importantly, wider society as the international framework for action going forward, and as such is seen by many as providing the clear direction to the shipping sector and its partners to stimulate investment in the development of low- and zero-carbon fuels and innovative energy-efficient technologies. I also have to inform you that since then I have been attending several conferences and meetings in the UK and outside. I have received huge commendation and encouragement and very nice words about the achievement you accomplished last April. According to my recollection, I believe that, at least referring to the past two to three decades of IMO history, this was the time that IMO has been higher praised, commended and encouraged. I received huge nice and commending words about what you have done. I tried to explain what happened, how the IMO Member States, the IGOs and the industry have been collaborative and patient until that important historic decision was reached. Therefore I firmly believe that you should be proud of yourselves and of what you have achieved. I am proud of your excellent work and patience. I am confident that your Group will be able to keep the momentum and build upon the accumulated experience from previous sessions. You have shown a remarkable ability to address issues of the highest importance. 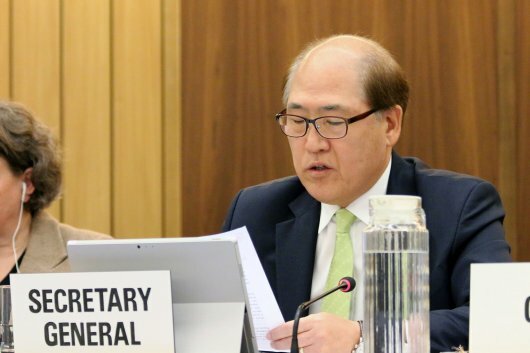 In establishing this fourth intersessional meeting, the Committee renewed its confidence and knew that you would deliver a constructive outcome, with IMO's unique spirit of cooperation and under the able leadership of your Chair, Mr. Sveinung Oftedal of Norway. I am sure that you are now all willing to engage fully in the development of a programme of follow-up actions of the Initial Strategy, therefore I wish you the best success in your deliberations.